« Strategi: Hur stoppar man en framtida Trump? Historia: Politik och pubar i gamla England! DIALOG │ Internet och social media är inga förutsättningar för förolämpningar och halvsanningar i dialogen mellan politiker eller medborgare. Detta skriver Mark Hailwood, författare till Alehouses and Good Fellowship in Early Modern England, i januarinumret av History Today. Senaste valrörelsen i USA må ha varit unik vad gäller den negativa tonen mellan Donald Trump och Hillary Clinton men var knappast speciellt unik i ett längre historiskt perspektiv. Political debate is eternally fractious. In what has been a politically tumultuous period it has become an increasingly common assertion that we are witnessing a rapid deterioration in the decorum of public and political debate. It is self-evident, though, that digital technology is not a prerequisite for fractious interpersonal political exchanges. Division and hostility were, for example, rife in the face-to-face world of 17th-century political discussion. The growth of political awareness and discussion in 17th-century England – what we now call ‘public opinion’ – has been associated with the rise of the coffeehouse from the 1650s onwards, a place where urbanites could go to read that emerging product, the newspaper, and to engage in caffeinated chatter over the state of the nation in a civilised and rational spirit. But long before the coffeehouse came onto the scene both town and country dwellers of all classes had used another site of liquid refreshment as a place to gather and debate politics: the pub. Commonly known as the alehouse, the local pub had enjoyed a period of growing popularity in the century between 1550 and 1650, with numbers more than doubling from around 25,000 to 55,000 – or one alehouse for every 90 inhabitants of England. Almost every village would have had at least one such establishment and part of its appeal was the opportunity to engage your neighbours in political debate. A difference of opinion was likely to descend into the trading of insults, blows, drinks thrown in the face – or even with being hauled before the authorities for a capital offence. The anonymity and physical distance provided by the computer screen are neither necessary nor sufficient for the development of bitter and fractious cultures of everyday political discussion to emerge in times of political turmoil. 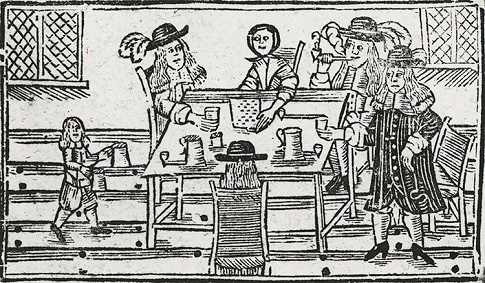 Bild: “Woodcut of a tavern scene, English, 17th century”, History Today.